Series 100 diaphragm pumps are lightweight, heavy-duty, and fully adjustable. 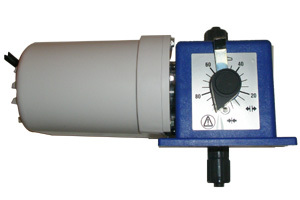 30 GPD/115V or 230V with maximum operating pressure of 100 psi. 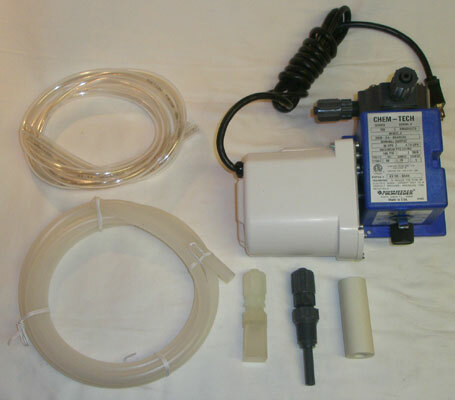 This is a diaphragm-type metering pump. A fluid is pumped from a chemical storage tank to the point of injection by the pulsing action of the diaphragm. The four check valves (top and bottom of pump head, strainer assembly, and injection assembly) keep the fluid flowing toward the point of discharge. To insure the solution being pumped can only go forward, it is important that all check valves provide a positive, non-leaking backflow prevention. The wetted end (those parts that contact the solution being pumped) is constructed of SAN, PVC, TFE, Hypalon, and polyethylene. These materials are very resistant to most chemicals.